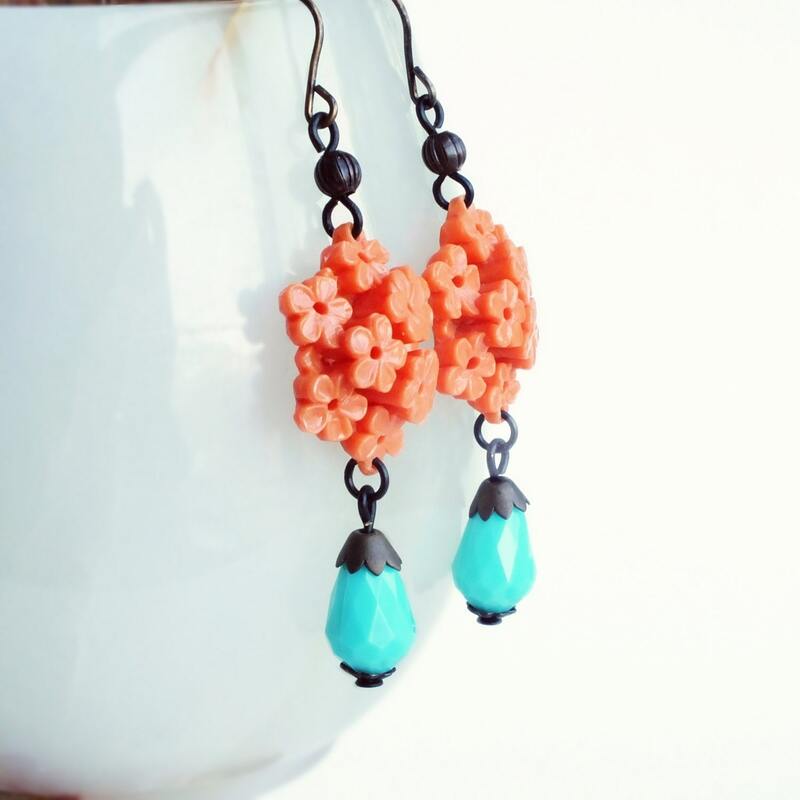 Handmade coral flower earrings with vintage floral bouquets and turquoise resin beads. 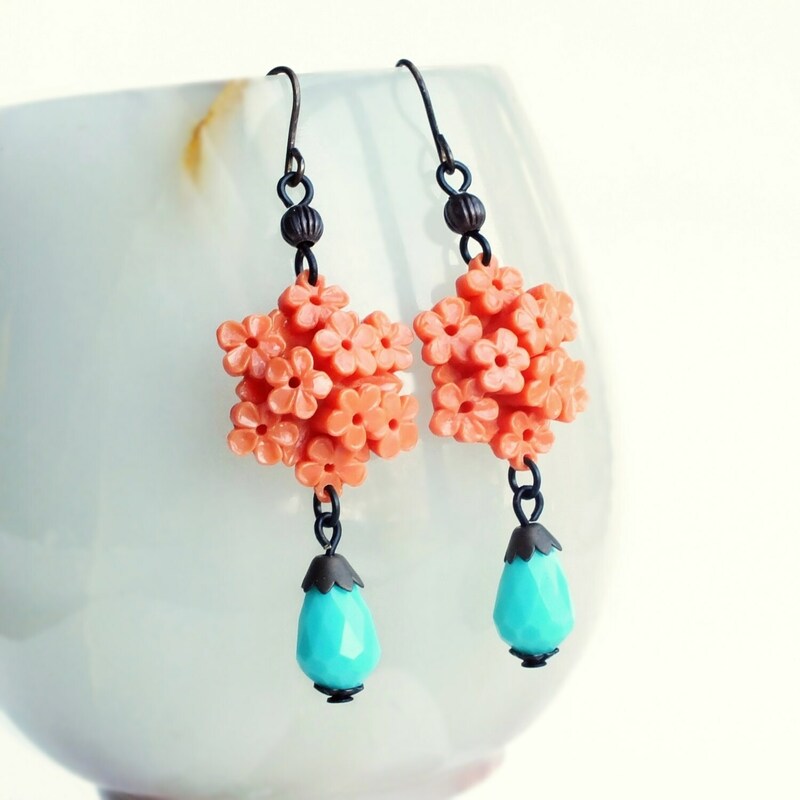 Genuine vintage resin and celluloid materials. 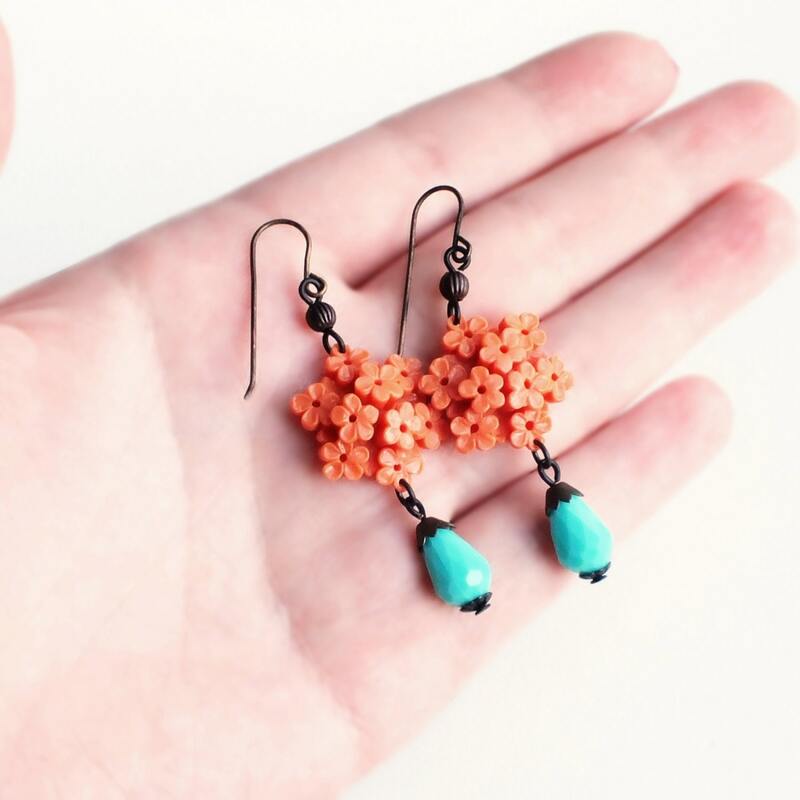 US made antique brass settings, designer ear wires and beads. 2 1/2 inches - 6.4 cm long. 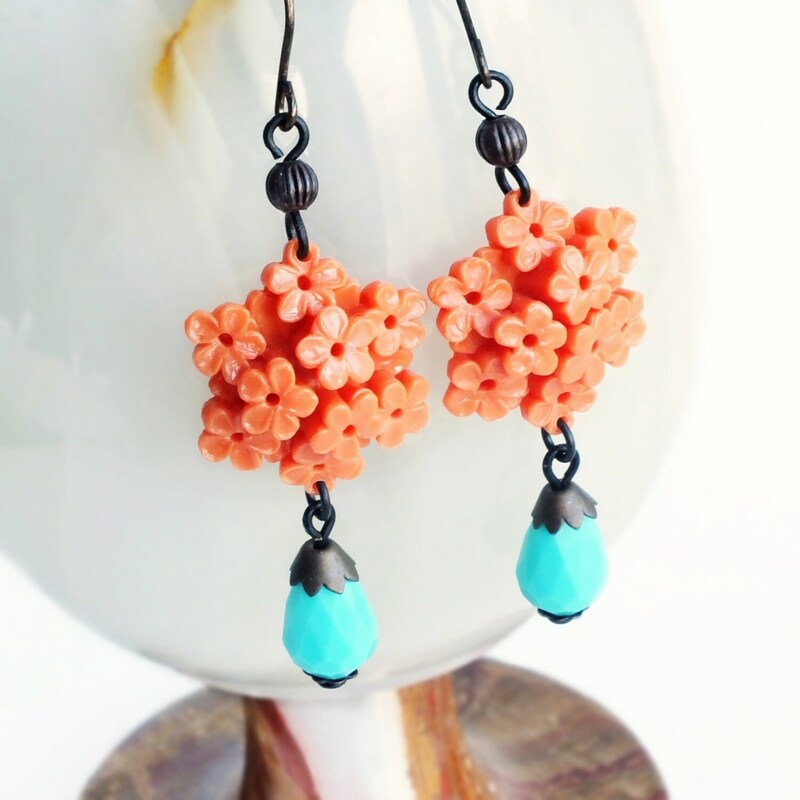 Coral aqua earrings made with beautiful genuine vintage dimensional celluloid flower bouquets in a pinky coral color adorned with bright vintage turquoise resin dangles. 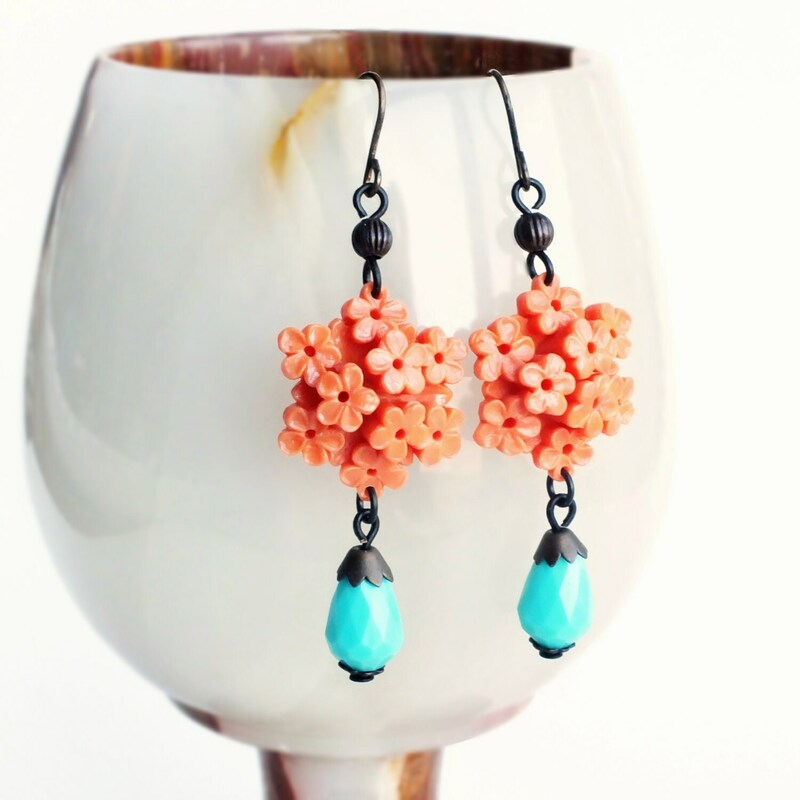 Check out more gorgeous vintage style jewelry! -Lever-back antiqued brass ear wires. Select from drop down menu located under price before clicking 'Add to Cart'. Attractively packaged in eco-friendly handmade paper gift bags ready for gift giving. I ship from Toronto, Ontario, Canada using Canada Post. Packages are sent within 48 hours of payment. An email will be sent when your items have been shipped. Shipping times are not guaranteed. Tracking is not included. Contact me for faster shipping, tracking options, and costs. Buyers are responsible for any customs and import taxes that may apply. All packages crossing international borders (including into the USA) include detailed customs forms with items and value. It is against the law to omit or falsify this document. It is against the law to mark packages as 'gift' to avoid possible customs charges. All orders are tastefully wrapped in tissue paper and placed in handmade hand-stamped kraft gift bags. Orders are shipped in bubble mailers. Boxes are used for thicker items (i.e. most rings) and large orders. I can include a note card with special wishes on demand. Plants are shipped in boxes with newspaper. When is an order considered lost in the mail? Are orders insured against loss or damage? All orders are insured for damage and loss. Replacements or full refunds are given including shipping costs. Can I purchase in person? Orders can only be bought online. Pickup is available for downtown Toronto. I can shorten or lengthen necklace chains free of charge. Custom orders are possible for some requests. Will I be charged customs on arrival? Canada and US destinations will not incur custom charges. Every country has their own laws and policies regarding the possible taxes charged on purchased goods imported into the country. I cannot provide any guarantees on whether or not you will be charged customs. It is up to each buyer to educate themselves on their country's import policies. All packages crossing international borders include detailed customs forms with items and value. It is against the law to omit or falsify this document. It is against the law to mark packages as 'gift' to avoid possible customs charges. I will not risk my business by breaking the law. -Canadian orders do not include tracking. It can be provided at additional cost. -US orders are tracked with USPS, UPS or Ascendia. -Certain international destinations include tracking.